RESOURCES ON PREGNANCY THAT I RECOMMEND. Juno Magazine – all about natural parenting, raw foodie Kate Magic has contributed a great deal to this magazine. When Hamish and I decided to start a family, we had not idea how quickly it would happen! I concived Isaballe on the night we decided to start a family and in some ways that came of a bit of a shock. Maybe it was that we were both 100% Raw? Maybe it was the forces of the full moon in play! But I knew the moment we conceived, it was like a lightening bolt moment, maybe it was the universe sending us the spirit of Isabelle! My plan was to have a Raw pregnancy as I had been 100% RAW for 22 months prior and I wanted to continue as on my RAW journey throughout my pregnancy, having heard of many benefits including it being a relatively quick and pain free labor. However what happened 6 weeks in to my pregnancy shook my raw identity to the core! At 6 weeks into my pregnancy I started to have severe raw food aversions and unfortunately some of these aversions were my green smoothies, my big yummy salad, anything GREEN basically! I started craving toast, cheese and eggs. I had been a 100% RAW Vegan for 22 months and here I was craving cheese. So I did my research and asked other Raw Women had they experienced this? To my surprise what I found is that many women who are 100% RAW when fall pregnant have massive RAW food aversions. This gave me a lot of comfort. Here I was 100% RAW Vegan Sarah wanting tomato and cheese toasties something I thought I had emotionally and physically given up some time ago. It was a great shock to not only to me but also Hamish who could not believe what was happening, especially as we had talked about having a RAW pregnancy. I felt that my identity as Raw foodie was being challenged to my core! However what I did learn very quickly is to never judge a person and their journey in life! Sure looking back now, I cant even imagine eating these foods right now, but then I clearly remember the urge and the need to consume them. I was also extremely fortunate throughout my pregnancy that Hamish was supportive and committed to making sure that I received the best nutrients (even though I was faced with so many food aversions) I could! At the six month mark into my pregnancy I was starting to crave RAW foods again, not all the time but slowly by the third trimester in my pregnancy I was eating salads again, loving my green juices and green smoothies! So that by the time Isabelle was born I was back to a very high raw diet! What I did eat during my pregnancy though was the following Raw Oats with Almond Milk for breakfast, lunch I tried to have salads, but often it was a salad sandwich I needed the bread to get the salad into me. I did eat a lot of fruits while pregnant, and I craved avocados to the extent I would eat nearly one a day! One of my biggest cravings was vegetable green curries. I never ate meat through my pregnancy and I always chose organic cheese, and we had chickens which were feed organic scraps ( we used to give the eggs to guests ) so I knew these were a sustainable choice. I choose sprouted bread instead of white bread where I could. And stir frys were my dearest friend with buckwheat noodles. What I would recommend to any mum who is faced with not being able to do a RAW pregnancy is be gentle on yourself. Let your body guide you. And try and be wise on your cooked food choices – I always ensured that any wholefood that passed through my lips was Organic. 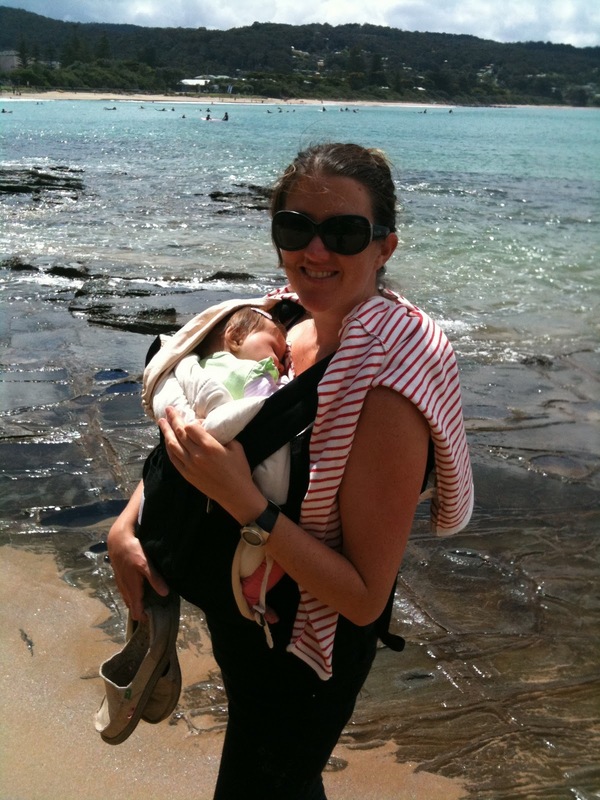 During my pregnancy I swam twice a week and the week and to be honest it is one of my greatest pregnancy memories. In Australia our hospital systems are very different to what I hear it is like in other countries. And luckily for Hamish and I we had found a very beautiful doctor who was 100% behind me in my birth plan! And that was a water birth. In our hospitals here it was very much looked on in a positive way! Hamish and I live about an hour from a hospital, so a home birth was out of the question in case anything was to go wrong. But to be honest I was very happy with the hospital and staff we had chosen. Isabelle was 10 days late and I was induced and my planned water birth didn’t go to plan! Looking back I wish I had have waited a few more days instead of being induced? I was extremely fortunate that this was the only intervention. Isabelle was born to a 6 hour labour, It was one the most amazing moments and experiences of my life. She latched on a few minutes after being born and is now a healthy breast feed baby! I couldn’t and still cant believe I have created this gorgeous little being who I have to say is the most chilled out little bubba you could ever imagine! We also plan to have another child, and that delivery is going to be a bit different – I will do a Lotus Birth or delayed Cord Clamping. This is where the umbilical cord is not cut ( or waits until the cord stops pulsating) and is instead kept attached to the baby to naturally fall off. I wish I had known about this before I had Issy – but I know now and that’s the main thing.